Throughout the 2018 GiveBig campaign, we are sharing the inspiring stories of the PTMSC’s support for marine mammals. Plan your donation now to support place-based, people powered, hands-on learning at the Port Townsend Marine Science Center. Knowledge is power, and together we can inspire even more people to conserve the Salish Sea! PTMSC Marine Mammal Stranding Network volunteer Casey Gluckman. 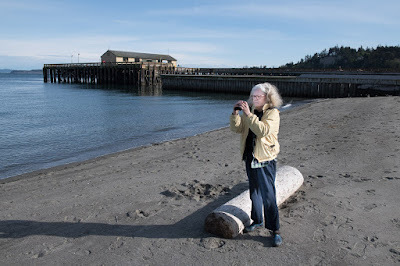 If you think Port Townsend Marine Science Center volunteer Casey Gluckman’s involvement with the Marine Mammal Stranding Network is a random act of serendipity, think again! Indeed, her story is one of a lifelong call to action to protect marine mammals and ocean habitat. After completing her master’s degree in geology at the University of South Florida, Casey met her future husband, David. She says that partnership “redirected her life,” leading her to pursue a law degree. Casey and David then opened their law firm, focusing on environmental and land planning law. “We also lobbied the state legislature and state and regional agencies for environmental groups and public interest health care organizations,” Gluckman says. Gluckman was soon offered a job as the director of the Division of Resource Management in the state Department of Natural Resources. Among her many responsibilities was oversight of the state manatee protection program. 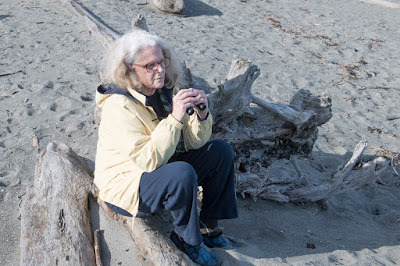 “I learned a lot about marine mammals and the coordination between federal, state and local governments, plus encouraging volunteer efforts by corporations and individuals,” Gluckman explains. When the often-searing heat of Florida summers posed a health challenge, the Gluckmans packed up and headed north to the Olympic Peninsula, where they had visited several times. Once settled, they began to pursue volunteer opportunities. beach near the Port Townsend Marine Science Center's Marine Exhibit. “Marine mammals continue to draw me, so working with the stranding program was a natural choice,” Gluckman says. It has been 10 years since Gluckman joined the PTMSC’s Marine Mammal Stranding Network volunteer corps. Her only regret is that she cannot devote more time to the effort. Indeed, ask MMSN volunteers why they do what they do, and a common theme begins to emerge. 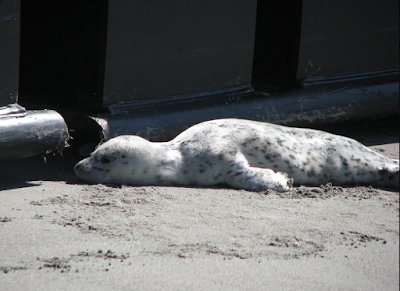 Indeed, anyone who has ever gazed into the inky eyes of a harbor seal pup knows it’s often a case of love at first sight. They are among the most common of the marine mammals in the Salish Sea. But every hour spent guarding these precious pups is also an hour of unparalleled first-hand observation. 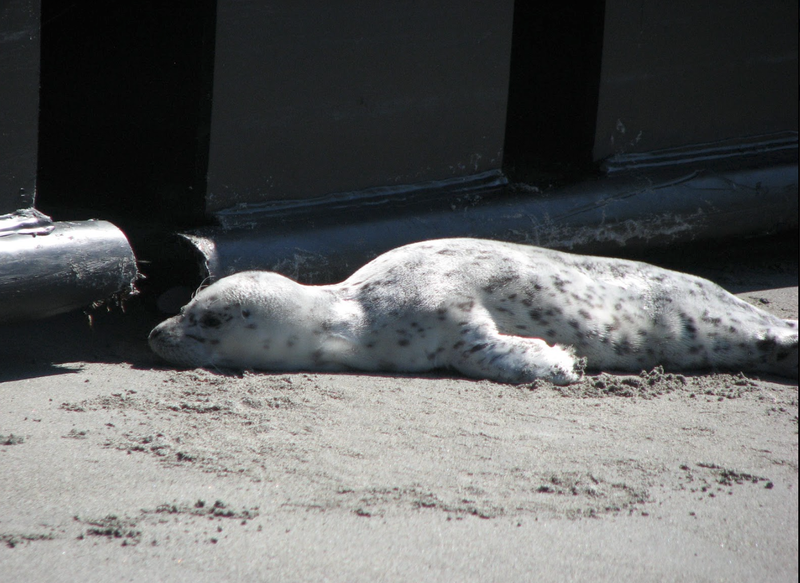 In fact, many of the MMSN efforts relate directly to protecting seal pups during the busy summer tourist season. Several years ago, two several-hundred-pound elephant seals chose the downtown Port Townsend beachfront as their molting spot. Northern elephant seal, "Buddy," in 2013, one day after hauling out to molt.